Windows 10 revealed: Read about that and more in PCWorld's November digital edition. The Enhanced Edition includes videos, slideshows, podcasts, and other interactive features—all designed for consuming on your tablet. The Replica Edition is a PDF-like version that’s enabled for your mobile device’s touchscreen. We take an in-depth look at an early version of Windows 10, which is due to be released next year. Microsoft’s upcoming OS combines a reborn Start menu with Windows 7’s live tiles. • Chromebooks beyond the cloud: We explore everything Chromebooks can do when they're offline. • The 4 reasons I switched from Google to Bing: If you're still Googling, you haven't seen the latest improvements in Bing’s search engine. Recent convert Mark Hachman explains why he switched. • The best gaming mice of 2014: Up your game by finding a better mouse. Our in-depth guide shows you what to look for and how to analyze your needs. • See Microsoft’s new Windows 10: See an early version of the new OS in action. • QNAP’s TurboNAS TS-251 reviewed: Senior Editor Michael Brown reviews QNAP’s versatile two-bay NAS box and explains which type of user will get the most out of it. • Lenovo Y40 gaming laptop: Lenovo’s 14-inch gaming laptop cuts a few corners but delivers a great gaming system for a very attractive price. With fall in full splendor, we’re celebrating by offering our readers great autumn savings: Subscribe to our Digital All-Access Pass and get full access to every PCWorld Enhanced Digital Edition plus our Replica Editions for only $19.97—an 76% percent savings. Existing subscribers who want to take advantage of the fall savings will have the new subscriptions added to their current subscription term. Current subscribers can visit PCWorld.com/directions to learn how to access PCWorld on any device and start reading the August issue right away. Not a subscriber? 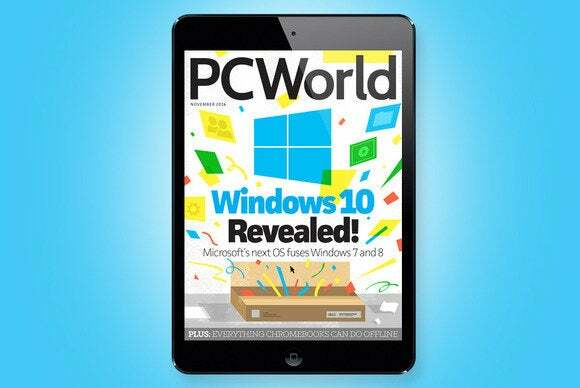 With the PCWorld Digital All-Access Pass, you can get access to the digital magazine on as many devices as you’d like! Plus, you get access to both the Enhanced Editions and the Replica Editions. Subscribe today, or learn about other purchasing options by visiting PCWorld.com/magazines. We created our Enhanced Editions to bring subscribers a new experience with exciting new features designed especially for mobile device platforms. Learn more about the Enhanced Editions. Our Replica Editions are also available as part of the PCWorld Digital All-Access Pass, and are like a digital version of a print magazine in a PDF-style format. Learn more about the Replica Editions.